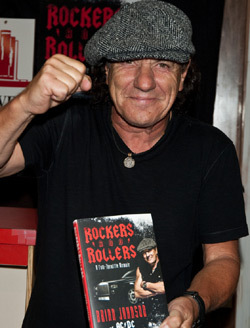 Speculation that Brian Johnson and Phil Rudd are working with Angus Young on a new AC/DC album spiked when Johnson reportedly ran into members of the band Terrorizer in a Florida airport Monday and they got him to admit that the rumors are true. A post on the group's Facebook page read, "We ran into Brian Johnson from ACDC at the airport today after the flight home and we asked him about the rumors of him being on the new ACDC album and he said "Yes" and that he is " Sick of denying it". So that was a cool surprise ending to the tour." Rudd and Johnson had been sighted late last year with Angus and Steve Young at a Vancouver studio.